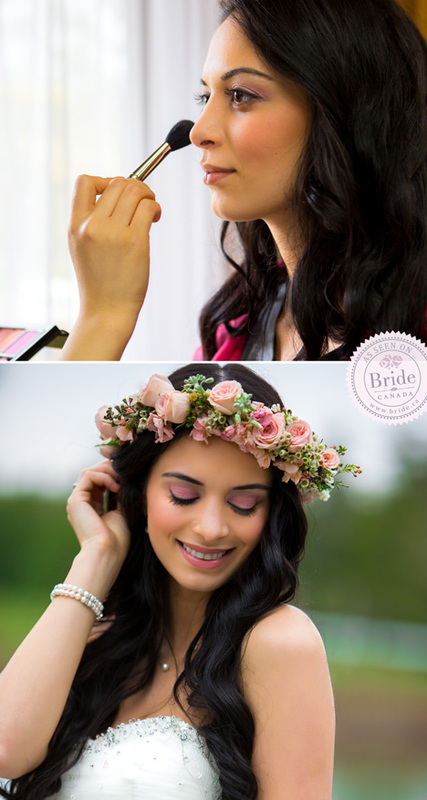 bride.ca | Styled Shoot: Blushing Bride! Inspiration in Blush, White, Cream & Gold!
" 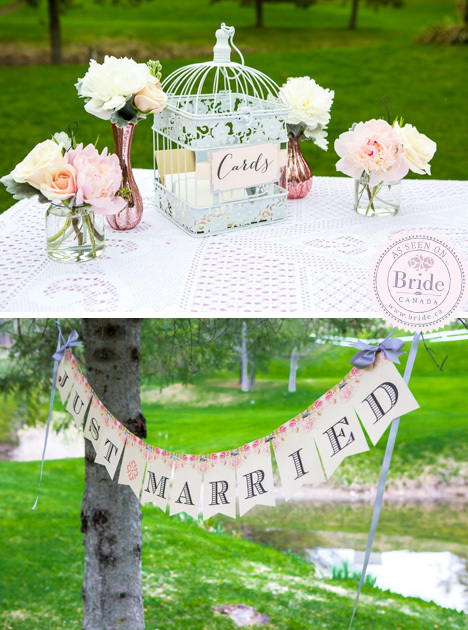 The vision was to create a romantic and rustic wedding shoot withwhimsical undertones, ideal for the down to earth bride who loves flowers, ruffles, lace and everything pink! " 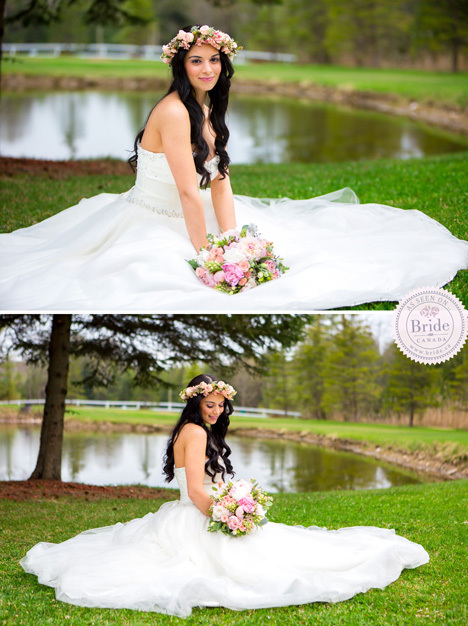 The whimsical floral headpiece focused on mini pink roses to frame the bride's lovely face. 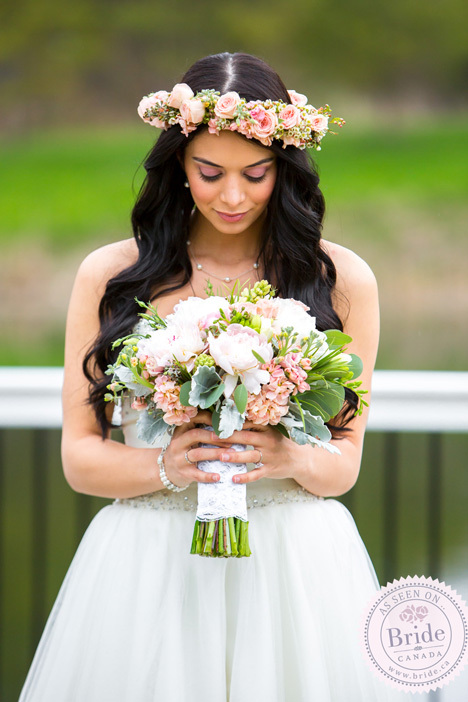 Her stunning bouquet featured peonies, roses and other soft florals creatingblush-peach-pink-rose palette. The greenery added interest and brought back the rustic outdoors feel to the bouquet wrapped up with white lace and pearl pins. The stationary included a circular rose-print style menu card with charming font. 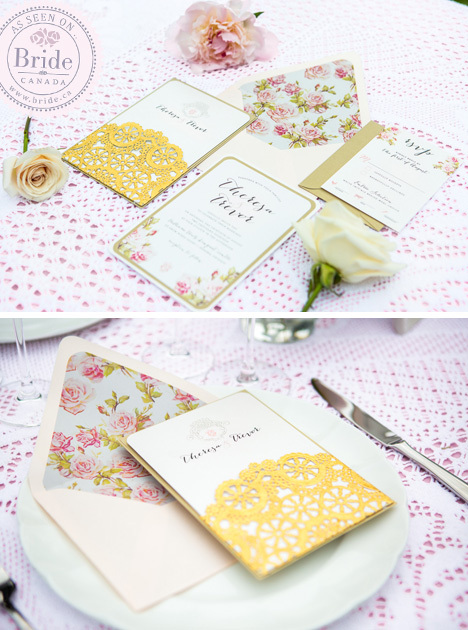 The invitations were stunning withwhite invitation card dressed up with gold painted doily overlay, elegant font, and a blush pink envelope with rose pattern peek-a-boo interior. The whimsical program cards featured a pictogram wedding party on a rustic cardstock. The striking two-tier cake sat upon a ruffled edge cake stand. 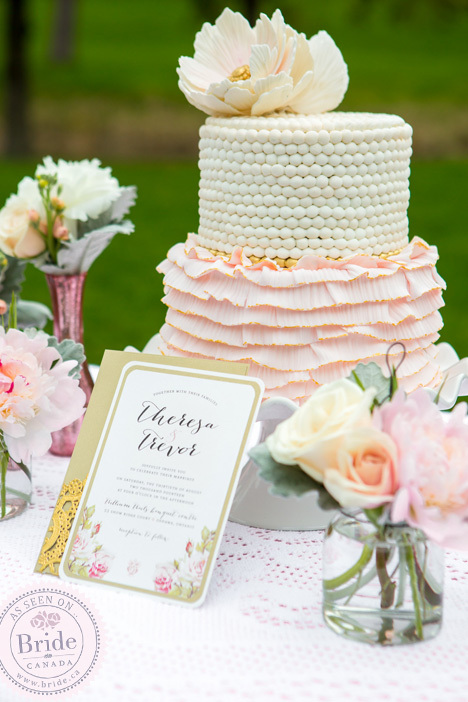 It featured soft blush ruffle layer dusted with a hint of gold on the edges sitting beneath a white pearl beaded layer topped with a flower with delicate pink petals and jewel-like gold center. 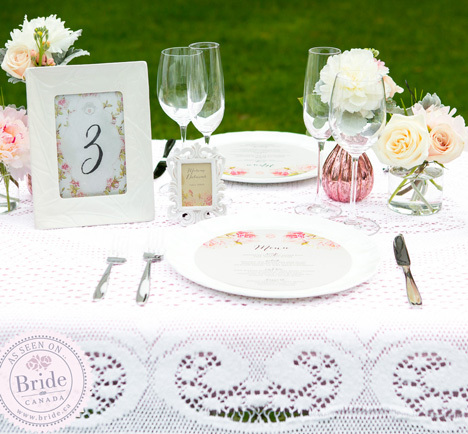 The table was dressed with a medium weight lace overlay, with pink tablecloth peering through the intricate lace pattern. The romantic, whimsical feel was carried through the place setting which included ruffled edge bone china plates and lightweight stainless steel cutlery. Wine and champagne glasses sparkled and added a touch of elegance to the rustic table. Avoiding the single centerpiece design, we went with 3 pink-gold mirrored vases and 3 clear glass lantern vases (both of which would also make great wedding favors and keepsakes) showcasing a variety of soft, luscious flowers, and creating a casual cascading centerpiece. The table was anchored bylovely floral table-number frame, and mini-frames with guest names forpersonalized seating experience. The bride wore elegant drop pearl earrings, with a matching pearl necklace and double pearl bracelet, not to outshine the classic, singular stone engagement ring. The bride's beauty was enhanced with soft natural blush lips, pink hue eye shadow, mascara and liner to enhance her eye shape, and an overall warm wedding glow. Her hair was styled down with loose, natural curls allowing bounce and movement. The white romantic wedding dress with beaded sweetheart neckline and a-line tulle skirt provided an effortlessly dreamy silhouette. It is actually model #NB1053WG from The One Bridal's in-house collection. Our location was a Bavarian style lodge with impressive grounds showcasing lush hills, an adorable foot bridge overpond,stone foot path and plenty of blossoming trees. The grounds focal point is a deluxe white arbor that spans the ceremony space. We decorated the main alter space withcustom made paper garland that showcased white doilies, white ruffled cones, and pops of pink textured flowers.